Get Your Tampa Bay Home SOLD! The Duncan Duo Team at RE/MAX consists of a diversified group of experts focused on helping you accomplish your real estate goals. Whether you are selling a multi-million dollar luxury home or a starter house, moving up, or buying an investment property – The Duncan Duo team has the tools to help you as they have done for the thousands of customers they have served. Our Team has achieved massive success, accolades and rankings because we put our customers first and focus on helping them sell their home fast and for top dollar or help them buy the right property with expert negotiations. But don’t just take our word for it, watch the 400+ video testimonials from our customers embedded above or see the countless 5-star reviews (more than any other Tampa Bay Realtor) on Zillow, Facebook, Google, Trulia, Yelp, and Realtor.com. Some of our rankings and accolades include: #1 RE/MAX agents in Florida several years running, Ranked between #1 and #5 consistently in the world for RE/MAX (100,000+ Agents), #1 Tampa Bay Realtors in both listings and sales per Zillow & MLS stats, Inc5000 ranked as one of America’s Fastest Growing Companies 4 years running, Ranked in the Top 25 Teams in the Country (there are over 2 million Realtors) via RealTrends and The WallStreet Journal, and Official Real Estate Agents of The Tampa Bay Lightning. Our accomplishments have garnered the attention of many celebrities who now endorse our service as well as several media outlets that regularly contact us for real estate related insight. Our impressive list of endorsers include: Jack Harris from 970WFLA, Veronica Alfaro from 995QYK’s Marc & Veronica, and Ron Diaz from Ron and JP on 620WDAE. You can also tune in to hear The Duncan Duo Real Estate show every Sunday at 10am on 970AM WFLA. While the accolades are great, our mission statement and our core values drive us to succeed by doing the best for our community, our customers, and our team members. We hope for the opportunity to help you accomplish your real estate goals. 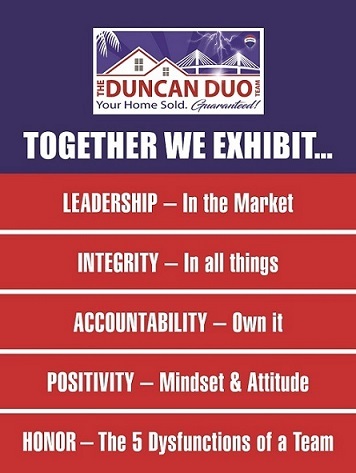 The Duncan Duo team will lead the Florida real estate market by providing world class service through the most innovative tools, agent education, positive energy, leadership and community support. Watch Segments from our Tampa Real Estate Radio show as well as our TV and radio commercials with Jack Harris, Ron Diaz and The Tampa Bay Lightning. "Worked with Tarin and her team through the Duncan Duo to sell a rental home in New Tampa. Gave us good direction from a pricing standpoint and home ... more "
"Dear Jonathon Wald, You could not have been a more perfect realtor for me when helping me to find the most perfect home for my needs here in lovely ... more "
"This was my first time selling a house. I am amazed how professionally it was handled from day one. Everyone from the time I signed the contract with ... more "